Overview: Meet Barbara Gordon, librarian and daughter of Gotham City Police Commissioner James Gordon. With an invitation to the Gotham City Policeman’s Masquerade Ball, Barbara is making a female-fitting version of the Batman costume. While on the way to the ball, Barbara encounters a robbery in progress, and jumps in to stop the crime. Later on, she can’t stop thinking about the rush she experienced as a crime-fighter. Making her costume more practical for physical activity, Barbara joins the Dynamic Duo as a protector of Gotham City, as Batgirl. Early on, Batgirl was brought in every couple of issues to help Batman and Robin with whatever case they may be working on. But her popularity grew as a character, earning her a back-up feature role in the pages of Detective Comics. While most of these stories are one-and-done, towards the end of this run an ongoing story arc was introduced by Frank Robbins and Don Heck. Barbara reveals her secret identity to her father, who being a good cop had already deduced her secret. Barbara gets elected to Congress to help represent Gotham City in Washington, D.C.
Why should these stories be Showcased? : Batgirl was created at the request of the producers of the Batman television show, hoping to add a new female character to the show’s third season. 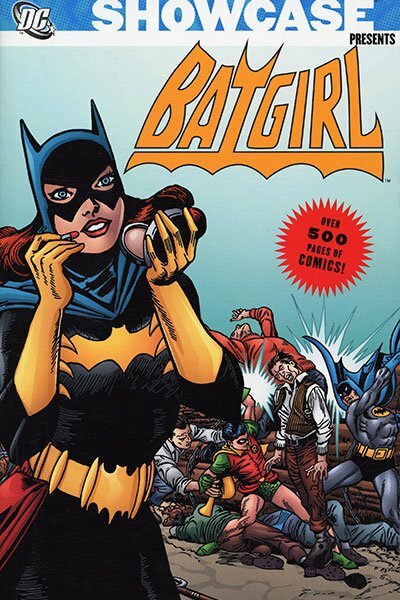 Appropriately enough, her first comic appearance was titled “The Million Dollar Debut of Batgirl!” The show helped cement Barbara Gordon’s place in the Batman universe, and the writers and artists found ways to take advantage (albeit slowly) of this incredible character. This is a great volume to own, and share with readers of all ages. My only complaint about this volume is the cover image they chose for this volume (Page 1 from Detective Comics #371). Seriously, could DC find a more sexist image to use? I understand that Batgirl was not used on many covers during the time frame that this book covers, but the covers to Detective Comics #359 or #369 would have been much better choices to use over the cover image above. Footnotes: The stories from Detective Comics #359, #363, #369, & #371, and Batman #197 were also reprinted in Showcase Presents Batman Vol. 3. Batman #214 was also reprinted in Showcase Presents Batman Vol. 4. Detective Comics #400 & #401 were also reprinted in Showcase Presents Robin the Boy Wonder Vol. 1. The Brave and The Bold #78 was also reprinted in Showcase Presents The Brave and the Bold Batman Team-Ups Vol. 1. World’s Finest Comics #169 was also reprinted in Showcase Presents World’s Finest Vol. 3. World’s Finest Comics #176 was also reprinted in Showcase Presents World’s Finest Vol. 4. Justice League of America #60 was also reprinted in Showcase Presents Justice League of America Vol. 3. If you like this volume, try: tracking down a copy of The Brave and the Bold #33 (June 2010), during the J. Michael Straczynski run on the book. This story is set in the days prior to the events of Batman: The Killing Joke (and if you need info on why that book is important, you probably shouldn’t be reading this blog). Zatanna has had premonitions of events coming up in Barbara Gordon’s life, so she and Wonder Woman take Babs out on the town for a night of fun. Cliff Chiang draws a beautiful yet realistic female figure, and was a perfect choice for this issue. This issue was collected in the Team-ups of the Brave and the Bold hardcover, which collected the JMS issues of The Brave and the Bold. This entry was posted in Batgirl, DC Showcase Presents and tagged Batgirl, Batman, Carmine Infantino, Curt Swan, Don Heck, Frank Robbins, Gardner Fox, Gil Kane, Mike Friedrich. Bookmark the permalink. Pingback: Throwback Thursday – Showcase Presents Batgirl Vol. 1 | WORST. COMIC. PODCAST. EVER!